For those of us who need a little more than pumpkin-spice-whatever to get into an autumnal state of mind, may we suggest a vacation that gets you (temporarily) out of the sunshine and propels you deep into Pacific Northwest vibes? 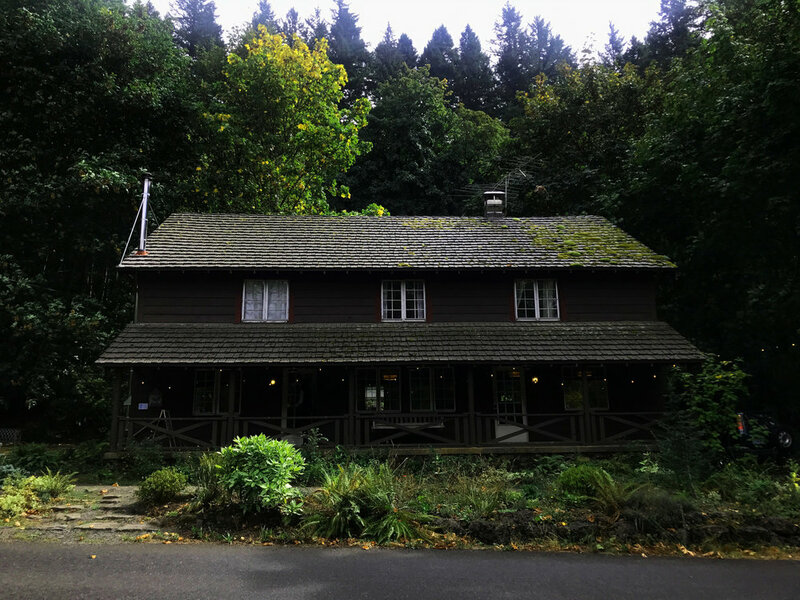 By now we’ve all been made aware of the treasures Portland has to offer — hip spots to eat and shop, an artsy-eclectic aesthetic, and a lush green landscape — but what you may not know is how accessible the city is to more remote, rustic spots that can help you achieve the ultimate cozy fall getaway. Recently, Buick invited us to explore Northwest Oregon’s terrain in a brand new Encore, a smart and compact SUV that — much like the tiny homes we stayed in — proves that sometimes the best things come in small packages. For two days, we cruised the area and checked out the best B&Bs, eateries, and scenic stops within a reasonable driving distance. Read on to see our favorite destinations along the way. If you’re flying in or out of Portland and only have time for one quick stop, let us recommend this sweet breakfast and lunch spot near the Northeast Alberta District. Both locals and visitors love Sweedeedee for homemade, seasonal dishes and irresistible baked goods. The salted honey pie is must-have here. Since you’re already there, kill two Portland birds with one stone and go right around the corner for prime vinyl shopping at this beloved record shop. With a wide selection that includes punk, funk, metal, jazz, and more with both iconic and indie artists represented, this place is a music lover’s heaven. 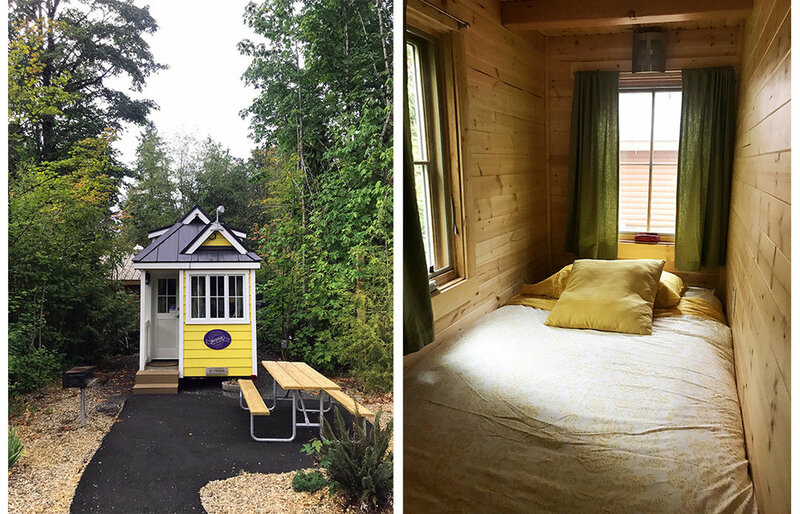 About an hour outside Portland, you can try out the tiny home trend at this teeny village, owned by Petite Retreats. Since you’ll likely be outside more than inside on this trip, it’s the perfect cozy place to crash. That said, despite the lack of square footage (we stayed in a whopping 175 sq ft!) your mini abode has everything you need: an individual decorative theme, a flat screen TV, wifi, a full kitchen and bathroom, and a bakery/restaurant on the property where you can grab huckleberry pancakes (with locally picked berries, of course) for breakfast or prime rib for dinner. If this spooky hotel atop Mt. Hood looks familiar, it’s because it’s probably burned into your memory as the Overlook Hotel, AKA the haunted setting of The Shining. The drive to the lodge is worth the trip in itself; the day we visited it was engulfed by fog and the trees that lined the winding road up were straight out of a Kubrick flick. If it’s snowing when you’re there, this is where you’ll want to do your snowboarding and skiing. We’re told the chairlift here is one of the world’s oldest! This impeccably designed bed and breakfast feels a million miles away from the city — even though it’s only about 30 minutes. In close proximity to incredibly scenic hikes and sites (see below for an example), this rustic-meets-modern inn has all the luxury amenities you’d want for a dream cabin getaway. Named for its resemblance to — what else? — a bridal veil, this waterfall is just a quick walk from the lodge (novice hikers, this one’s for you). Surrounded by moss covered trees and lush plant life, there’s plenty of nature to take in, not the least of which are meditative, rushing waters themselves. This snack spot along the Sandy river this the perfect place to grab an artisanal soft serve sundae (pine nut honeycomb or lavender-blueberry sauce, anyone?) or a waffle grilled cheese. This is feel-good food made with love — and seasonal, locally sourced ingredients. Don’t make the mistake we made and neglect to actually go inside this iconic riverside restaurant. The name — and old-school neon sign — says it all: this is comfort food in a quintessential roadside diner setting. Vintage touches like Tiffany lamps, a rustic fireplace, and gingham curtains set the mood to enjoy soulful dishes like (obviously) stewed chicken with scratch-made dumplings and beer battered and fried scallops. Pro tip: the bathroom decor makes for a killer mirror selfie — just saying.